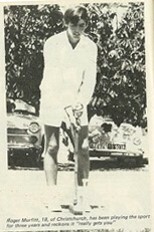 Roger commenced playing as a schoolboy at the Hornby Croquet club in Canterbury where his mother was a member. He once claimed he only started playing so he could enjoy the marvellous afternoon teas the club provided. He showed very early promise and was taken to a South Island Championship in Nelson by 1969 MacRobertson team player Jack McNab. Roger was greatly impressed and inspired by the dashing play of Gordon Rowling and Pat Rudolph who appeared to be completing triple peels in nearly every game they played. He joined United, where most of the leading Cantabrians played either as full or associate members, and enjoyed the fast courts and competition the club provided. Building on his success at the 1972 South Island Championships where he won the Open, Men’s and Handicaps Singles, he secured a position in the 1974 MacRobertson Shield NZ Test team by winning the NZ Open Singles. He mastered the fast courts with their rock hard hoops with great skill. Playing centre stance, standard grip he played with a longer mallet than most. He developed a flexible action employing a relatively short backswing. During the tournament he shot with great confidence seemingly hitting the “short’ lift shot with ease. Roger played in five MacRobertson series excelling in doubles in partnership with Joe Hogan. They, along with the Jackson/Skinley combination, were undefeated in NZ’s shield winning series in 1979 and 1986. Doubles laid the platform for the NZ victories and it was fitting that Roger a dedicated team player struck the winning blow in 1986 with his singles win. In addition to his playing record Roger contributed greatly to the game off the court: With Ernie and Iris Horwood, he resurrected the United Croquet club following the fire that destroyed the old United Pavilion. He served on the NZ Croquet Council, and was President from 1988 to 1993. During this time he led the sport’s difficult transition from one administered by player volunteers to one partially funded by the government sports agency and run by professionals with an office located with other national sporting bodies in Wellington. Besides his record as a player in the MacRobertson Shield, Roger was the team Manager in addition to playing in 1982. He was MacRobertson Shield team manager in 1993 and manager of three New Zealand Trans-Tasman teams. His achievements as a player and his contributions to the administration of the sport were recognised with the award of Life Membership of Croquet New Zealand in 1997. He hols a unique record by completing the World’s first fourth-turn quintuple peel, during the 1985 South Island Championships Doubles when he partnered Joe Hogan.